Raquel Marvez Mr. Adames displays a tattoo that he wears in honor of his late father. Sandy Adames has been working the deli at the Associated Supermarket on East Eighth Street and Avenue C for seven years. 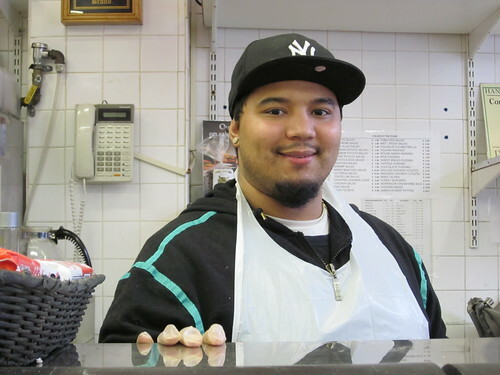 He knows many customers by name, and can handle the most complex deli orders with a meticulous attention to detail. But most people don’t know that Mr. Adames cannot read or write. “When I was 11, three years after my parents and two sisters moved from The Dominican Republic, I had a car accident,” said Mr. Adames, as he recalled being struck by a taxi cab while crossing the street. Mr. Adames, who’s 29, sustained an apparent brain injury and has had problems reading and writing ever since. Frustrated by the difficulties of learning, Mr. Adames dropped out of school and began working to make ends meet for his family. 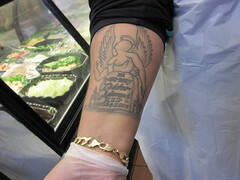 A supervisor at the supermarket, Candido Morel, said Mr. Adames’s sunny disposition has endeared him to deli customers. “Clients love Sandy because he is always happy,” Mr. Morel said. But Mr. Adames dreams of one day being able to read and write. His ambition, he said, is to work on computers. “I would love to provide better for my wife, daughter and the baby that is on its way,” he said. Created with Admarket’s flickrSLiDR. Click on each photo for detailed information about the image. Raquel Marvez is a field director and senior producer at The Generations Project. This post was the winning entry in a photography contest during the National Association of Hispanic Journalists Region 2 conference, which was recently held at NYU Journalism.